Running SXE366 and Hate it! What exhaust manifold studs do you suggest? S300 Turbo compressor cover to bearing clamp kit. Hold down kit.4 clamps8 bolts..
S300 Turbo bearing housing to exhaust housing clamp kit. Hold down kit.2 clamps4 bolts.. Compound Turbo Dual Seal Connector Kits can be used with compound turbocharged setups. Developed i.. 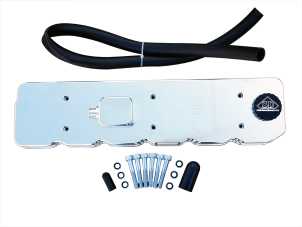 This Cummins billet valve cover was designed for the best balance of fit, finish, and functionality..
SEMI (Class 8) Turbo - BorgWarner S475 T-6 / 1.32 AR exhaust housing	96mm Turbine .. Premium 304 Stainless Steel exhaust manifold for CAT 3406, C15 & C16 enginesUnrivaled durability tha..
63/68/ T-4 divided non-gated 5 Blade - 2.50" HOSE OUTLET This turbo is for the 6.0 FORD and..
66/74/.91 T-4 divided non-gated 5 Blade - 2.50" HOSE OUTLET This turbo is for the 6.0 FORD and is..
***THIS IS A SEASONAL BOX - THRU OUT THE RACE SEASON, WE GATHER MORE GOODIES FOR THE BOXES. AS.. Stainless Diesel "Flexfit" HatAvailable in Black color onlyS/M (6 3/4"-7 1/4")L/XL (7 1/8"-7 5.. 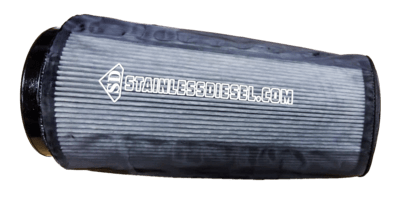 Stainless Diesel "Railroad Style" HatDri Duck - 3331Charcoal Color Only100% cotton, brushed twillStr.. Stainless Diesel "Trucking Style" HatDri Duck - 3350Grey Color Only100% cotton, brushed twillStructu.. Stainless Diesel "Oil Field Style" HatDri Duck - 3330Grey Color Only100% cotton, brushed twillStruct.. Stainless Diesel "Farmer Style" HatDri Duck - 3351Saddle Color Only100% cotton, brushed twillStructu.. Stainless Diesel "Excavating Style" HatDri Duck - 3325Dark Brown Color Only100% cotton, brushed twil..
Gildan 'Soft-Style' T-shirts. Small - 4XL sizes available Black color only.. While browsing the web & studying up on why you need a 5 Blade Mafia turbo ---- you came across .. 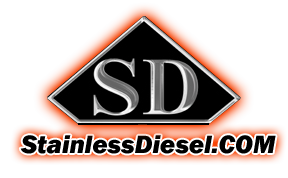 Stainless Diesel's Turbo Wheel Oil Cap for your 5.9 and 6.7 Cummins Engine.Fits 1998 to 20.. Carry your Stainless Diesel thumb drive on your keychain with your dyno data & see your dyno pro.. This is a set of HIGH QUALITY ZINC ALLOY, POLISHED, TURBO CHARGER CUFFLINKS!Perfect for any boo..
Billet 5 Blade compressor wheel pierced earrings.some may have the center drilled thru (some solid c.. This hose is built for endurance and performance in custom coolant plumbing applications where a t..
3.50" ID to 5.50" ID x 4.00" long, high temperature, 5-ply reducer boot. Strength tested to handle ..
3.50" ID to 3.50" ID x 4.00" long, high temperature, 5-ply straight boot. Strength tested to handle ..
4.00" ID to 5.50" ID x 4.00" long, high temperature, 5 ply reducer boot. Strength tested to handle ..
6.7 Cummins Crank Case Ventilation Kit INCLUDES: CCV Hose & ClampSpecially designed for r..
5.00" to 5.00" Rubber Hump Hose this is a heat rated boot made to be fitted onto turbo covers for fi..
T-3 divided metal turbo Gasket..
S-300 Flange replacement Orange O-ring..
Hx35 and Hx40 replacement elbow O-ring.. 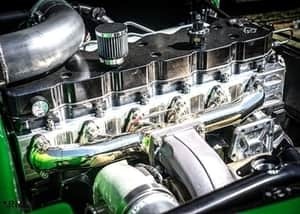 The simple, effective way to connect exhaust system components. 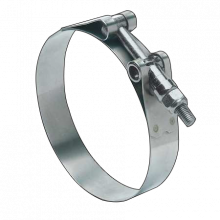 Preformed joint replaces U-bolts ..
V-band Clamp. Fits S400 Compressor Cover Outlet. Fits every S400 that has a S400 cover with v-band..
V-band Clamp HX40 - 4"
HX40 V-band Clamp fits HX40 flangeFits 4" tube diameter..
Great customer service. Running 2nd gen swap with s465 on my 2017 for over 20k. Makes the 6.7 a whole new animal. 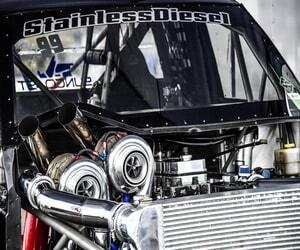 Stainless Diesel is a great shop and they have great people helping. They have always answered my questions and got me set up with the right parts for my truck or build. From builder pieces to complete turbo kits this is the place for you. Super awesome to deal with and they are always super polite and welcoming to give you advice on whatever project you're working on. The parts, well they don't cut corners. Have not been disappointed yet. 100% recommended. They're manifolds are hands down awesome. Looks amazing and performs even better. Noticed an instantly faster spool and lost 100° at WOT on the pyro. Definitely worth every penny.